While most of the time we deal with ‘serious’ news, occasionally we come across something I’d classify as being more light-hearted such as with this call for dating advice from Big Buck Hunter fans. We were contacted by Nerve.com and they do a dating advice column often looking for such advice from a variety of different sources – from bridesmaids, to voice over actors to medieval historians and more. So with them looking for Big Buck Hunter fans is at least a sign that one group of arcade players is being recognized! If you’re interested in being a part of the article, send some answers to the questions below to anna.davies@gmail.com. Tell them that you found out about it from Arcade Heroes. They need an answer by next Monday (the 20th). pretty well, but he won’t Facebook friend me. 2. 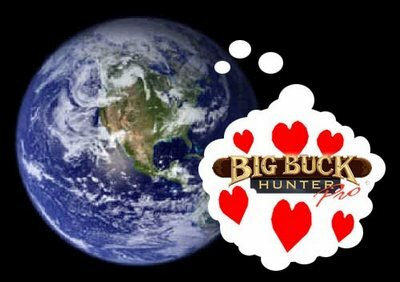 What’s the best thing about dating a Big Buck Hunter champion? away or try to get them to get along? 4. What’s the best way to flirt with a Big Buck Hunter champ? for another low-key, yet classy, first date venue? get him to never, ever talk about it again? is true, but is it weird? them. Any suggestions for how to learn to love them? rubber. What’s the best way to tell him? would like to continue to see him? I totally don’t. How can I let him know without hurting his feelings? that or will he get weirded out? like she’s saying I’m fat. Is the relationship doomed? himself. Is it whore-ish to accept the offer? bad to slip in a bad word about him to the hiring manager? me feel like I’m being boring—is there anything I can do?